Thank you to everyone that has contacted us, to find out how we are in light of the current protests that have being taking place in Bangkok. We are well and NightLight have briefed us on what to expect since they experienced similar protests and political unrest in 2010 for the same reasons (this political issue has now been in the fore front for about 7 years). We are not worried or afraid, actually the opposite, we feel a sense of peace! We have been praying in our regular staff meetings for God’s will, direction, wisdom and peace to prevail. We understand that the news can sometimes over sensationalise the way the events are. We think you have probably had more information from the BBC & Sky News than we have had in country. If some of you are unsure what the Thai protesting is about. Here is our guide that will fill you in. The anti-government group (also royalist) want the current Prime Minister, Yingluck Shinawatra, to step down, so they began holding demonstrations at the end of November. The protests up to 30 November had been peaceful with no trouble. The opposing group for the government the ‘red shirts’ (anti royalist) want Yingluck to stay in power. The reason why the anti-government are against Yingluck Shinawatra, is due to her brother former Prime Minister Thaksin Shinawatra, who has been a controversial figure. He is a billionaire who was accused of corruption and fled from Thailand after a coup in 2006. Some Thai residents think she has just been a puppet for him. He has been living in exile in Dubai; those against Yingluck have accused her of being his proxy. There are even stories of him running government meetings by phone. Earlier this year, current Prime Minister Shinawatra’s party introduced an amnesty bill to the legislature which her opponents feared would allow Thaksin Shinawatra to come back to the country and resume power. So this was the reason they began protesting in November. In spite of this Shinawatra’s party does have supporters, they are rural Thai folks and in the past their demonstrations have been even larger. The city residents in Bangkok mainly support the opposition Democratic Party. 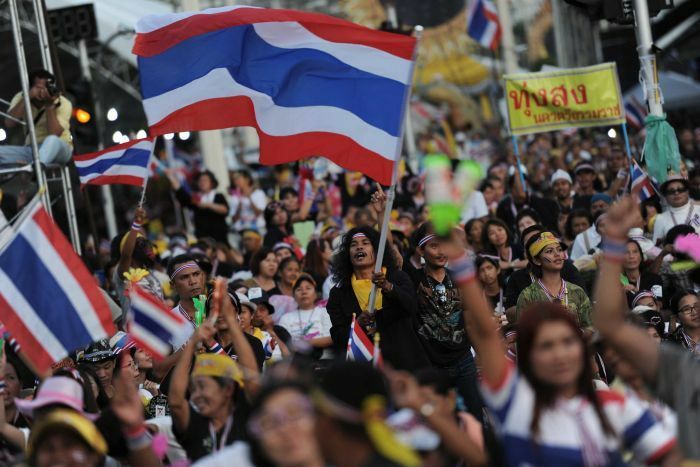 About 100,000 people protested in Bangkok at the beginning of the rallies, on 24 November. The number has dwindled since then. The protests had been peaceful but by the end of November, there were clashes and as a result of this, four people died and many more were injured. Around 33 countries issued travel warnings against visiting Thailand. It has however become less dangerous in recent days, so many countries have chosen to lift their warnings. A complete halt to the protest was requested for Thursday 5 December. This is the official date for the King of Thailand’s birthday (also Father’s Day). King Bhumibol Adulyadej, is the longest serving monarch in Thailand. Every year the King delivers a traditional speech. In his 86th birthday speech he urged for unity, peace and for Thai’s to support each other for stability and security for the sake of the country. For peace and unity to prevail. For the leadership from both sides to act wisely. For the cessation of violent conflict and loss of life. That this will not have a drastic effect on Thailand’s economy. That Thailand may come to know hope in Christ, rather than hope in man.